There is nothing we cannot do….. in addition to manufacturing the world’s best rubber ducks, we have created custom floating boats, octopus items, manta rays, pink flamingos, turtles, sharks, fish, otters and penguins and more. We can make almost anything, not just rubber ducks, as we have done it all. 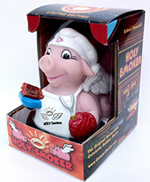 CelebriDucks creates extraordinary specialty items for some of the world’s most famous Companies and Corporations. Our custom promotional premium advertising items and custom specialty designs are unique in that they all come in their own high quality gift boxes which tell the story of your company. They thus become a perfect way to promote your business or fundraiser with our custom designed promotional items, or to create a whole new source of revenue. With their unsurpassed detail in our sculpting and painting, we are considered the finest rubber ducks on the market and the top custom duck manufacturer in the world. Below you can see an example of our creations for SeaWorld, Caesars, The Margaritaville Cafes, nationwide hotels, and other great companies. These fun and unique custom creations that we make for our clients are a very popular advertising and promotional item that people love. 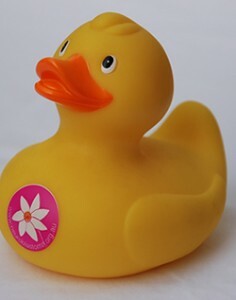 With the recent concerns spotlighted by the media and environmental groups regarding questionable materials used in making these kinds of products, CelebriDucks has created it’s rubber ducks to meet all safety standards worldwide to produce one of the safest and highest quality rubber ducks on the market. CelebriDucks rubber ducks also make a fantastic item for fundraising. 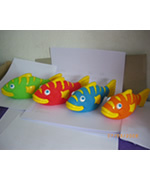 You can use any rubber duck or other fun animals we have in stock or we can design a specific custom item just for your event. They are a great way to raise funds for schools, teams, non-profits, etc, and make an exceptional collectible for people to own and enjoy. 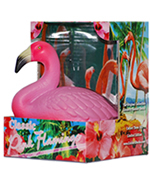 We created a Pink Flamingo for Caesar’s famous Flamingo Hotel in Las Vegas. It remains a top selling gift item at the casino year after year. The fact is, people LOVE pink flamingos! 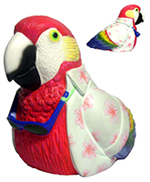 We created a gorgeous tropical parrot for The Margaritaville store locations. Remember, it’s always 5:00 somewhere!! 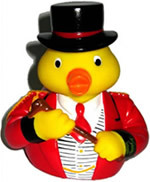 We custom designed a very special rubber duck of The Peabody Duckmaster for The famous Peabody Hotel in Memphis. Their marble fountain in the hotel lobby is actually graced with real living ducks! Actual mallards live in the hotel, coming down to the fountain every day from their penthouse suite until they are full grown and, on retirement from their Peabody duties, are returned to the wild. The Peabody ducks march through the lobby twice a day coming down on elevator led by the a guy dressed up a little like our duck called The Duckmaster at 11 a.m. and 5 p.m. daily. 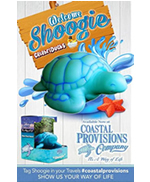 We created Shoogie, this fantastic floating turtle in a tropical themed gift box, for Coastal Provisions in Hilton Head Island in South Carolina. Tourists absolutely love him as he has been a big seller in their themed restaurants and gift store locations. 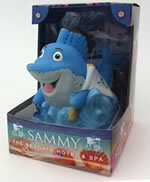 The glorious Seagate Hotel and Spa in Del Ray Beach, Florida had us create their Sailfish mascot for them. It’s amazing and floats beautifully which is our specialty! I can’t begin to describe how much work we put into Sammy here. 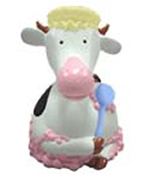 Bubbles the Cow was created for the Cow’s Ice Cream chain in Canada….a match made in cow and ice cream heaven! Polar Spas in Canada contacted us to create their mascot as a collectible gift item that they could sell in their stores. So welcome Tubbs McCool, their mascot, who sits on an ice float which, yes does float upright, and adds some very cool arctic fun and flair to any tub! The Battleship New Jersey museum is a living monument featuring one of the actual classic battleships that was a major part of World War II. 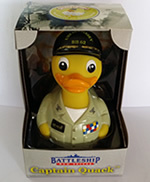 They had us create the first ever military duck that was 100% designed and sculpted in the United States!!! You can buy one on their website by clicking here. 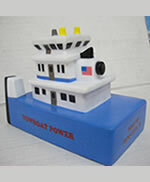 The Hennepin Boat Company had us create this Towboat for them. Wow, was this a difficult project as you know that boat had to float great! So much detail also. SeaWorld asked us to create a Manta Ray for them that would float upright and look fabulous. Take a look at this guy. Who says a Manta can’t be cute! 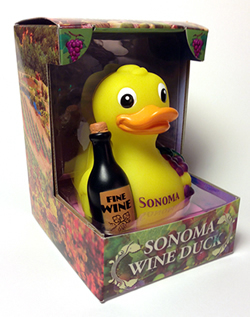 A client came to us who lives in the heart of the Northern California wine country to create a Sonoma Wine duck with a beautiful wine themed gift box. Needless to say it has been very popular! 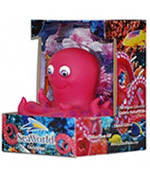 We produced an Octopus for SeaWorld in a beautiful underwater gift box. They wanted us to create one that would float perfectly upright with distinctive painting on the body. This little baby was a big hit and people loved him. SeaWorld is one of the premier theme parks in the world so it was a pleasure for us to work with them to create this one-of -a kind collectible. 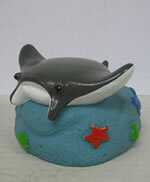 We don’t just make rubber duckies as there is no animal or mascot that we cannot make into a floating collectible! The Tugboat is an American Icon. We were flattered when a real life tugboat captain contacted us to see if there was any way to create a cute little tugboat that actually floated upright! 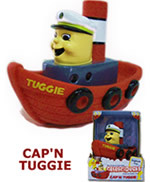 This was an engineering marvel for us, but after months of hard work, Cap’n Tuggie came to life! This new collectable rubber duck was made exclusively for Ducks in the Window. 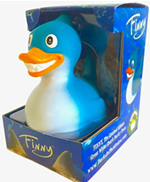 Finny is the first and only Great White Shark rubber duck, which has been in high demand among rubber duck collectors and enthusiasts around the globe. It’s only fitting as Chatham, Massachusetts has become one of the worlds “hot spots” for Great White sharks that Finny would be born and introduced to the world right there. The Sugar Factory stores are quickly becoming a Las Vegas institution. Their world famous Couture Lollipops are coveted by celebrities and A-Listers alike. Britney Spears, The Pussycat Dolls, Kim Kardashian, Lauren Conrad, and many more love the Signature Series Couture Lollipops! They have been written up in People Magazine, Us weekly, USA today, In Touch, OK Magazine, etc. and featured on ET, Extra, TMZ, E TV, and so many others. 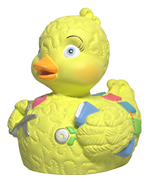 They had us create this very cute Sugar Factory Couture Pop rubber duckie which has been a big hit! 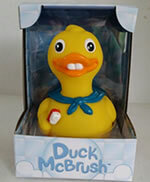 Our client in Wisconsin came to us to create the classic Cheese Quacker rubber duck! A big hit at the Frozen Tundra and all over the country actually! 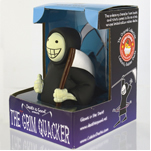 The “not so” Grim Quacker actually glows in the dark! Tony Tribby wrote this very cool book called “Death is Good, Adventures of the not-so-grim Reaper.” The book is just so witty, different, and life positive. 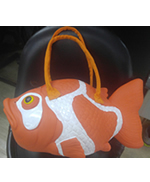 The good folks at the Lamb and Lion Inn on Cape Cod came to us to create Koi purse for them. CNN called their inn “One of the top pet friendly properties in the world” and the Travel Channel called them “One of Cape Cod’s best destinations.” The Koi purse is now one of the most unique purses on the market. Bob’s Space Racers runs Gaming Operations all over the world. They had us make four different colored fish that had to float just below the water with just a small part showing above. The fish also had to float upright and not tip over. They came out just great and look amazing! The Quilting Ducky was created for Jodie Davis, the President of the Quilting network and also the author of the definitive book on the history of the rubber duck! The Nebraska State 4-H Camp created the world’s first ever Floating BBQ Duck/Pig Race. All funds support the camp and future races will be sanctioned with the Kansas City Barbecue Society. What could be more fun? When The N.J. Devils won the Stanley Cup, their goalie, Martin Brodeur was at the podium on national TV with his lucky Martin Brodeur CelebriDuck that we did of him. 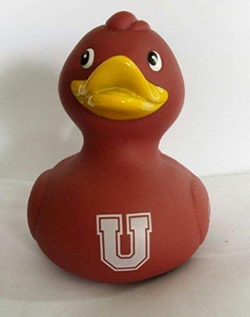 So when Union College came to us to create a Union College duck, I told them this story. And as we were working on it, it turns out they won the NCAA national division 1 ice hockey championship! Duckies Shop of Fun in Florida is all about the ducks! 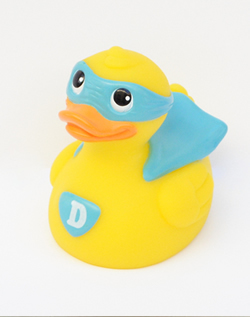 In fact Super Duck is part of their logo. They asked us to created a custom duck for the store celebrating their cool brand. Neuroblastoma is the most common solid tumor of childhood. It is almost exclusively a childhood cancer occurring most commonly between the ages of 0-5 years. It is a rare disease with about 40 children diagnosed with neuroblastoma each year in Australia. There is a chance of 1 in 100 000 of a child having this illness. The non-profit organization dealing with this in Australia came to us to create a duck for their fundraising. The Sherborn Dental Office in Massachusetts had us create Duck McBrush to go along with a new book they are publishing for children to inspire them to take care of their teeth.